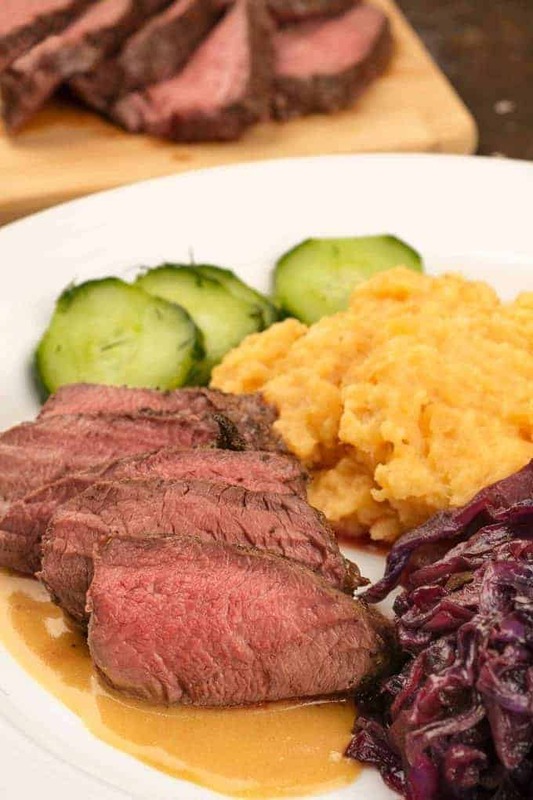 If you’ve been looking for an impressive main course to serve for a special celebration, this easy recipe for roasted venison may just fit the bill. 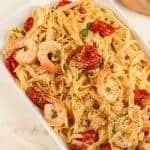 The flavors in this dish are sophisticated, unique and complement each other beautifully. Preparation is really simple, too. 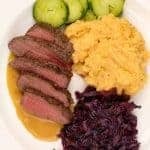 The venison tenderloins are crusted with a combination of Scandinavian-inspired spices that includes juniper berries, allspice, fennel and black pepper, pan-seared for a couple of minutes and finished to medium-rare perfection in the oven. A light, creamy sauce, made with gjetost (Norwegian caramelized goat cheese), chicken broth, sour cream and a splash of aquavit (see below for more info) is prepared while the meat rests before carving. Special note: This recipe is adapted from one we found on New Scandinavian Cooking. The site is a great resource, not just for Scandinavian recipes, but for cultural and travel information as well. If you’re an adventurous cook who likes to explore new cuisines, we urge you to check it out. 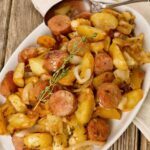 While commonly used in Scandinavian cuisine, some of the ingredients in this recipe definitely aren’t staples in the American kitchen. If you’d like to try this dish (and we definitely think you should), here’s what you need to know. Venison is a lean, flavorful meat that was once considered to be largely out of reach for anyone but avid hunters. Things have changed though, and quality cuts of farm-raised venison are available from specialty meat markets and online retailers. Our go-to resource for venison is D’Artagnan, an online purveyor of sustainable and humanely raised meats, game and poultry. D’Artagnan’s free-range venison is imported from New Zealand and is 100% grass-fed. 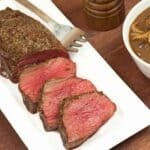 Available cuts include the tenderloins we’ve used in this recipe as well as steaks, chops, stew meat, shanks, ground venison and venison sausage. Gjetost (pronounced “yay-toast”) is a delicious Norwegian cheese with a sweet, caramel flavor and velvety smooth texture. The distinctive color and flavor of gjetost is the result of slow caramelization of the milk sugars during the cheese-making process. The most commonly found brand of gjetost here in America is Ski Queen, which is made from a combination of cow’s and goat’s milk. 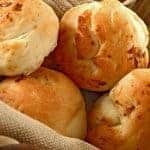 In addition to adding delicious flavor to the sauce in this recipe, gjetost can be sliced and served with crackers (we like Norwegian flatbread), melted with some cream and spices to make an alternative to chocolate fondue, or baked into a yummy sour cream apple pie. Similar to vodka, aquavit is a clear, distilled spirit. 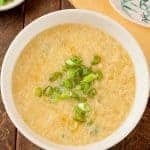 It’s flavored with caraway and various combinations of other spices and aromatics like fennel, anise, cumin, coriander, citrus peel and herbs. Best known as the primary flavor in gin, juniper berries are often used as seasoning for wild game. Their tart, almost citrusy flavor lends a nice contrast to rich, boldly flavored meats like venison and wild boar. Juniper berries are readily available on the spice aisle of most supermarkets, but it’s worth noting that they lose a lot of their flavor intensity over time. If possible, buy a small quantity and replace them after six months on the shelf. Place the juniper berries, allspice, kosher salt, peppercorns and fennel seeds in a mortar and pestle and crush to a medium grind. Sprinkle the venison tenderloins evenly on all sides with the spice mixture and rub it in gently with your fingers or the back of a spoon. Coat the bottom of an oven-proof frying pan with vegetable oil and place on the stove over medium-high heat. Lightly sear the tenderloins on all sides (no more than 2 minutes total), then transfer the pan to the oven. Roast the venison for 7 to 9 minutes, to an internal temperature of 130°F (medium rare). Test after 7 minutes to be sure you don’t overcook the meat. Remove the tenderloins from the oven, tent loosely with foil and let rest for 10 minutes. While the venison rests, make the sauce. Melt the butter in a saucepan over medium heat. Whisk in the flour and cook until golden, 1-1/2 to 2 minutes. Slowly whisk in the hot chicken broth until blended and smooth. Add the grated gjetost and stir until the cheese has melted and the sauce is smooth. Whisk in the aquavit and sour cream and continue cooking, stirring occasionally, for 3 to 4 minutes longer. To serve, carve the venison into 3/8-inch slices, and either transfer to a serving platter or plate individual servings. 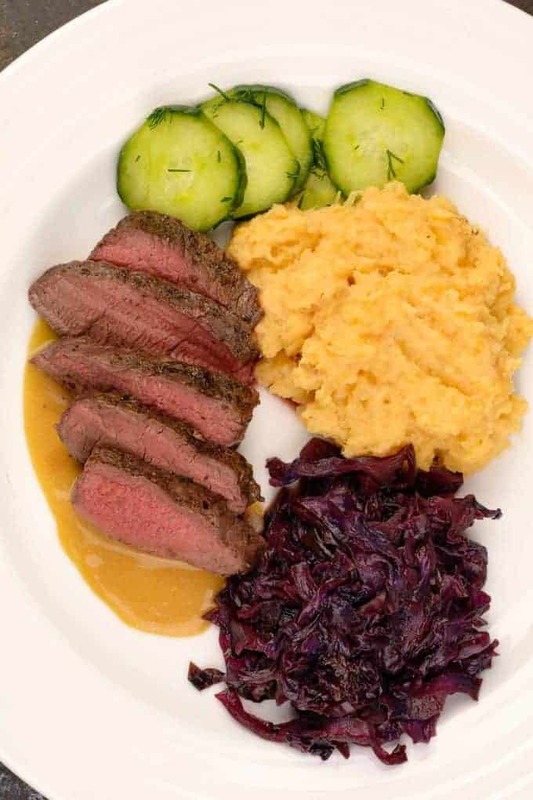 As pictured, we like to serve this entrée with classic Scandinavian side dishes like Braised Red Cabbage, Smashed Rutabagas and Dilled Cucumber Salad. This combination is part of our Scandinavian Style Christmas, a menu we’ve been serving during the holiday season for the last six or seven years. 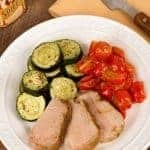 The seasonings and sauce in this dish work nicely with pork too, so if venison is not an option for you, you can successfully make it using pork tenderloins instead.